This Segmented Knife Blade is efficiently designed to optimize your ability to work in tight spaces. 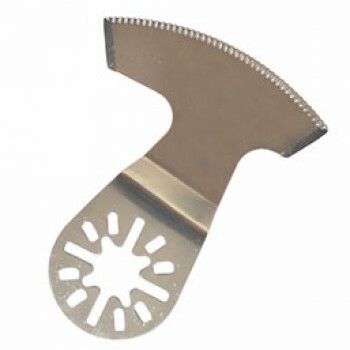 The engineered shape of this blade will help you to cut-out sealants situated around obstacles. This Flush Cut blade features a stainless steel semi-circle scalloped knife edge with a cut-away profile for very efficient removal of pliable sealants & caulking. This knife blade separates bonded materials. This Flush cut designed cutter efficiently removes sealants, caulking or adhesives. The design of this blade optimizes your ability to work in and around block forms or in tight spaces.